Celebrate this magical time of year with a delightful Christmastime river cruise through the beautiful views of the heart of Germany, on the Main Danube Canal, and the Main and Rhine Rivers. Board your ship in Nuremberg, Ger-many, host to one of the oldest Christmas markets in the country. Get into the holiday spirit as you stroll through the brightly illuminated and decorated Old Town. 200 stalls sell traditional German Christmas wares and seasonal delica-cies. In delightful Bamberg, a UNESCO World Heritage Site, you’ll find nativity scenes built by local citizens through-out the town. Learn about holiday traditions as you cruise to Würzburg, and here walk through the halls of the or-nate Bishop’s Residenz—home to the largest ceiling fresco ever painted. Then stroll through the Christmas markets while you sip Glühwein (hot mulled wine). Learn how to bake a traditional cookie before arriving at one of the charming small towns with half-timbered houses that are dotted along the Main River. In Rüdesheim on the Rhine River, see Europe’s largest nativity scene with life-size figures. Visit Heidelberg Castle, which towers magnificently over the city, and watch the skaters on the ice rink below. At this time of year, the his-toric charm of Strasbourg, France, is mixed with festive aromas, sights, and sounds—creating a truly magical atmos-phere! Visit the gothic cathedral with its ancient murals and fascinating astronomical clock. Continue your Christmas-time river cruise to Breisach, Germany—gateway to the famous Black Forest. An area of unrivaled natural beauty, and the home of Black Forest ham, cherry cake, and cuckoo clocks. There is no better setting at this time of year, when smoke curls from the chimneys of the traditional Black Forest houses. 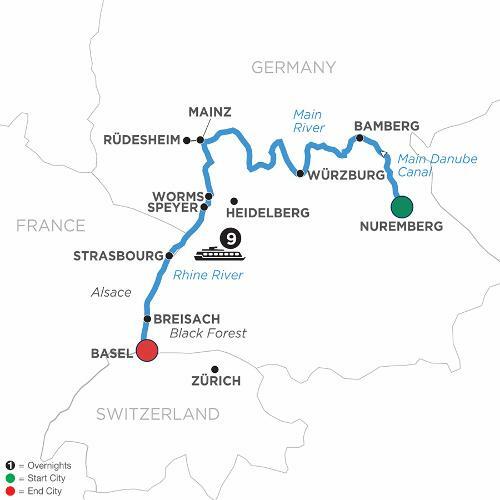 Your delightful holiday cruise ends in Basel, Switzerland.